Ever had a great big hole that you weren’t sure what was at the bottom? The Great Blue Hole, a giant marine sinkhole off the coast of Belize, is the world’s second largest, measuring almost 1,000 feet wide and more than 400 feet deep. It’s a UNESCO World Heritage site and was featured in Jacques Cousteau’s top five places to scuba dive. To discover what lies beneath, entrepreneur and British Virgin Islands resident Richard Branson, took part in the first ever deep dive to the bottom. And he didn’t discover someone living in a pineapple. Working alongside a group from the Discovery Channel, Branson and his team headed to Belize to support the work of Ocean Unite, to promote ocean awareness and the importance of strongly protecting at least 30 per cent of the ocean by 2030. The ocean is so critical to all of us and we want to do all we can to protect it. Upon arriving in Belize we met with Prime Minister Dean Barrow and had a really good discussion. We spoke about protecting 10 per cent of Belize waters – a wonderful first step towards 30 per cent. We also urged Belize to ban gill nets, which are known as the Wall of Death and do so much damage to marine ecosystems. The Prime Minister spoke of how important the ocean is to Belize’s people, its economy and its future. Excitingly, he said he was supportive of both measures. We’re hopeful of a very positive announcement before the New Year – it could be a wonderful Christmas present to the world. We also had the honour of meeting his delightful wife, who assured us she is the biggest advocate for ocean conservation and would continue encouraging her husband! 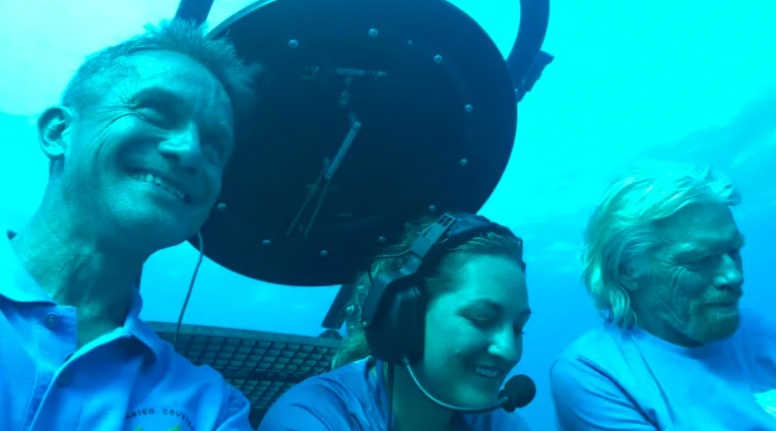 Branson travelled out to the dive site with Fabien Cousteau (grandson of the famed French explorer, conservationist and film maker), and Erika Bergman, who has so much enthusiasm for the ocean ‘she could live under water’. Once submerged after about 10 minutes, the team started to edge down the wall of the hole, where they faced a ‘breathtakingly beautiful’ stalactite. The Blue Hole is made of a complex system of caves that once formed on dry land. It is proof of how oceans can rise quickly and catastrophically. Sea levels were once hundreds of feet lower. 10,000 years ago the sea level rose by about 300 feet when a lot of ice melted around the world. At 300 feet down you could see the change in the rock where it used to be land and turned into sea. It was one of the starkest reminders of the danger of climate change I’ve ever seen. We then tried to go through a thick Hydrogen Sulphide layer, which had formed over centuries. It was extremely eerie. We didn’t expect to see any creatures below. But when we got to the bottom we could see crabs, conches and other creatures that had fallen into the hole, arrived on the bottom and then ran out of oxygen and died. Forget about fun loving sponges, awkward starfish, and socially inept squids, at the bottom of the hole Branson found, yeah, you guessed it: plastic. As for the mythical monsters of the deep? Well, the real monsters facing the ocean are climate change – and plastic. Sadly, we saw plastic bottles at the bottom of the hole, which is a real scourge of the ocean. We’ve all got to get rid of single-use plastic. Virgin Voyages, which kindly sponsored the expedition, is leading the charge. Our team all feel passionately about the environment. With every item we buy, every piece of food we serve, the environmental impact is paramount. There will be no single-use plastic on-board.